Leading off today: Rye football coach Dino Garr earned his 300th career victory Friday with a 47-7 victory against Sleepy Hollow. Garr, sixth on the all-time state list for victories (full list here), joined Tony DeMatteo as the only 300-game winner in Section 1. Garr, who is in his 40th season, including a stint at Westlake from 1979-85, is 258-81-3 at Rye, where he coached NYSPHSAA Class B champions in 2005, 2007 and 2008. "I was just blessed that John Nugent had faith in me to give me the job," Garr said. "Later on, they gave me another chance to come back. This is a very special time for me -- and to do it at Rye in front of the fans tonight or any night." Scary moment in Syracuse: Christian Brothers Academy principal Matt Keough said the CBA player who collapsed on the field during a game against Elmira was "responsive" and undergoing tests at an area hospital. The unidentified player was unconscious and not breathing after collapsing during a timeout midway through the second quarter, Syracuse.com reported. A trainer and doctors performed CPR until first responders arrived. By the time paramedics wheeled the player off the field, the public address announcer told the crowd the player was alert as he left. After discussions among coaches, administrators and players, the game was resumed. Elmira won 49-24. Streak ends: Lindenhurst's 30-game regular-season winning streak came to a half with a 16-14 loss to Northport in Suffolk II action as Justin Gerdvil made a diving interception with just over a minute to play. Lindenhurst drove more than 40 yards and faced a fourth-and-long situation when Gerdvil made the pick at the Northport 31. Northport held a 14-7 lead in the third quarter and pinned Lindenhurst in at the 1-yard line after a punt. Matt Fuggini broke into the Bulldogs' backfield and made a stop in the end zone for a safety and what proved to be the decisive points. Wild game of the night: The eight-man season got off to a wild start as South Lewis outlasted Pulaski 40-30 ... and that was just the score at the end of the first quarter. The final score saw South Lewis come away with a 72-50 triumph. Andrew Hoffman rushed for 383 yards and seven touchdowns to highlight the win. Big rally: Down 21-0 in the second quarter, St. Francis rallied to a 42-40 win over Ohio's Walsh Jesuit. Sophomore Jake Ritts threw three touchdown passes and ran for another to tie the score at 28, and St. Francis went ahead 42-34 with 2:15 left on a 13-yard slant from Ritts to Dom Brown. Walsh responded less than a minute later with a 31-yard touchdown pass, but the Frannies successfully defended a pass on the 2-point conversion attempt. Lancaster wins: In a rematch of last year's Section 6 Class AA title game, Lancaster made a statement with a 34-26 road win over Williamsville North. Lancaster, the defending NYSPHSAA champion, is ranked No. 1 in the state and WIlliamsville North is ranked 10th. Junior Jason Mansell was 17-of-31 for 159 yards and two touchdowns, and senior Gianluca Fulciniti added a TD pass, a fumble recovery and an interception to snuff out Williamsville North's final opportunity. Late heroics: Dominic Rogalo caught two touchdown passes from Tyler Beauregard, including the game-winning "Hail Mary" with no time left, as Watervliet edged Taconic Hills 22-16. Forks still perfect: Senior Jake Topa threw for 70 yards and a score and rushed for 90 and a touchdown to lead Chenango Forks to a 25-10 win at Owego in the hosts' first game on their artificial turf field. Chenango Forks is ranked No. 1 and Owego No. 24 in the initial New York State Sportswriters Association Class B ratings. Topa and fullback Lucas Scott connected on a 54-yard screen pass for a TD to give Chenango Forks a 19-3 advantage in the third quarter. Section 5 ranked action: No. 19 East Rochester/Gananda picked off Will Rogers (22 of 27, 270 yards, 3 TDs) four times and went on to a 49-36 win over No. 15 Penn Yan. • Ray Leach rushed 17 times for 187 yards and four touchdowns as Batavia rolled past Letchworth/Warsaw 40-0. Batavia is ranked 10th in Class B and Letchworth/Warsaw 20th in Class C.
• In Class D, No. 2 Alexander routed No. 8 Geneseo 90-14 as Chris McClinic carried four times for 157 yards with TD runs of 44, 71 and 44 yards. He also made two catches for 82 yards and a touchdown. Dylan Busch was 7-for-8 for 211 yards and four touchdowns along with four 2-point conversion passes in the first half. The Trojans led 60-14 at the half. • Red Jacket's Logan Keifer ran for 193 yards and a TD as Red Jacket earned a 40-26 win over Clyde-Savannah, ranked fourth in Class D.
Full night of work: Schalmont's Darnell Green scored on a kickoff return, a reception, two rushes and a 48-yard fumble return during a 63-14 win over Ichabod Crane. QBs stuff: Sophomore Anthony Campione, playing for injured brother Steven, was 17-for-19 for 240 yards and six TDs as Monroe-Woodbury routed Kingston 70-0. ... Lake George/Hadley-Luzerne beat Corinth 41-14 as the two teams' quarterbacks combined for one completion and three interceptions. ... Backup QB Aiden Kennedy threw an 80-yard touchdown pass to Chuck Bailey on his first varsity throw as Southwestern defeated Portville 49-7. ... Maurice Robertson, a late transfer from Sweet Home last month, threw for 254 yards and three touchdowns as West Seneca West downed Frontier 34-0 for its 18th straight win. More big numbers: Mose Hill ran for 194 yards and scored six touchdowns as Binghamton overcame an early two-TD deficit to beat Horseheads 51-35. Starpoint's Aaron Chase threw three TD passes to Max Bowen and five overall in a 55-30 win over Maritime/Health Sciences. Syncere Tatum (183 all-purpose yards) and Terry Anderson (13 carries, 248 yards) accounted for all eight TDs as Newburgh defeated Washingtonville 52-14. Blake Wolfanger booked 38 carries for 271 yards and two TDs as Perry/Mount Morris topped York/Pavilion 42-26. 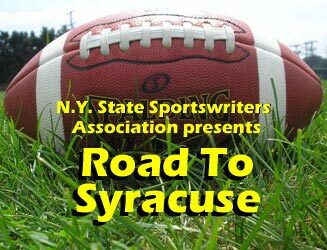 Scoreboard: You can view the Week 3 scoreboard on our Road To Syracuse website.